We were more than pleasantly surprised with our weekend stay at Pine Acres Family Camping Resort. 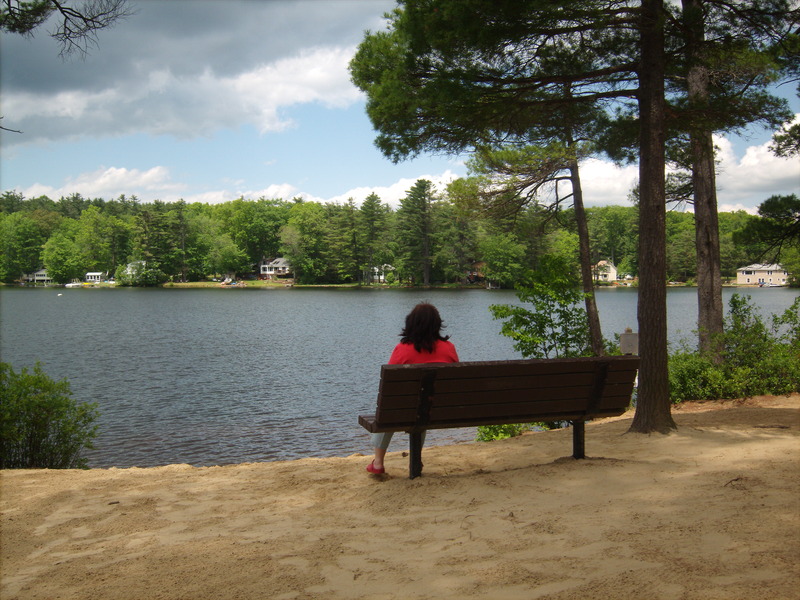 The park is located in Central Massachusetts, about 15 miles northwest on Worcester in the town of Oakham. It’s a little off the beaten path but well worth the trip. Our check-in was quick and the office staff made us feel right at home. We were escorted to our site by a friendly gentleman in a golf cart who asked if we were first time visitors and then reassured us that we would have a great stay. It turns out he was indeed correct. Pine Acres is a larger resort. They report 350 sites, all types and sizes. 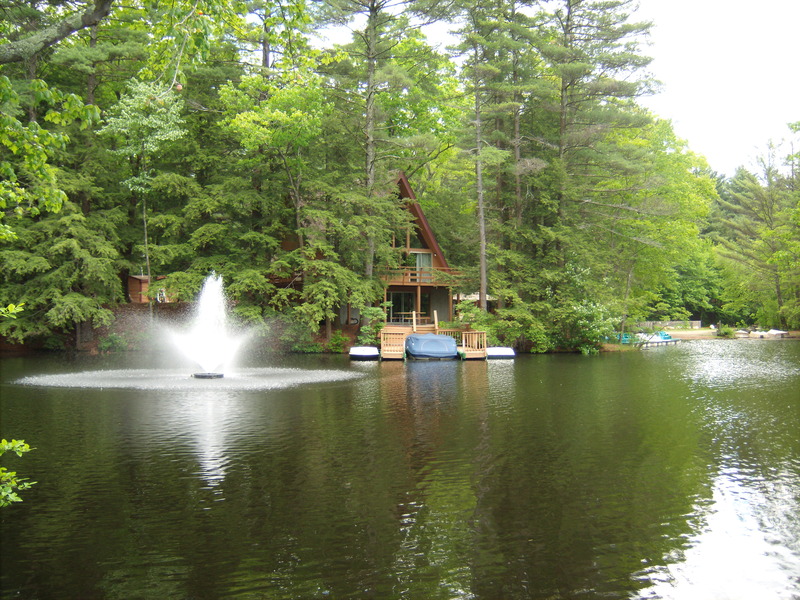 From very remote, primitive tenting sites to full hook-up premium lakefront locations. The Premium Lakefront sites were on the expensive side ($75/night), but since this was our first visit we decided to go for it. Despite the price, we were not disappointed. Our site was a comfortable size, with adequate room for our multiple slide-out 38′ Class A. The site included an oversized picnic table, complete with a cobblestone patio with a rustic double timber chairs overlooking Lake Dean, a small (70 acre) lake. Most of the heavily traveled interior roads are paved and wide enough for larger rigs. Once you get into some of the more remote locations, access is a tad more difficult via gravel roads(and some can be a little steep)… but if you’re a tenter there are some pretty isolated spots. The restrooms and laundry facilities were clean and well maintained. In fact, my wife commented that these were among the cleanest that she has ever seen. 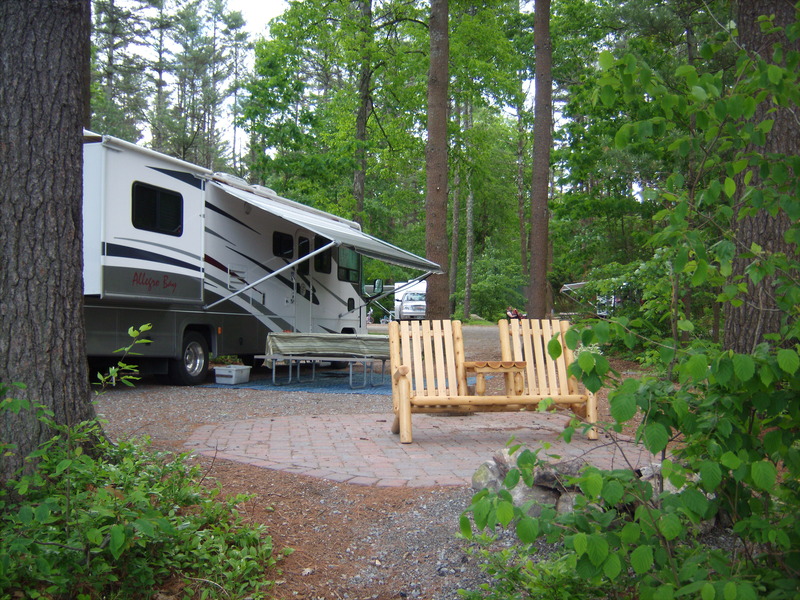 Over the past 25 years we’ve stayed at campgrounds all around the country… so that’s saying a lot. A small marina is located near the park entrance and the main office building. The marina includes “Uncle John’s Bait Shop” a boat launch area and boat slips (the fountain is a nice touch!). You can fish for bass from the beach or rent paddle boats, canoes, rowboats and kayaks here. 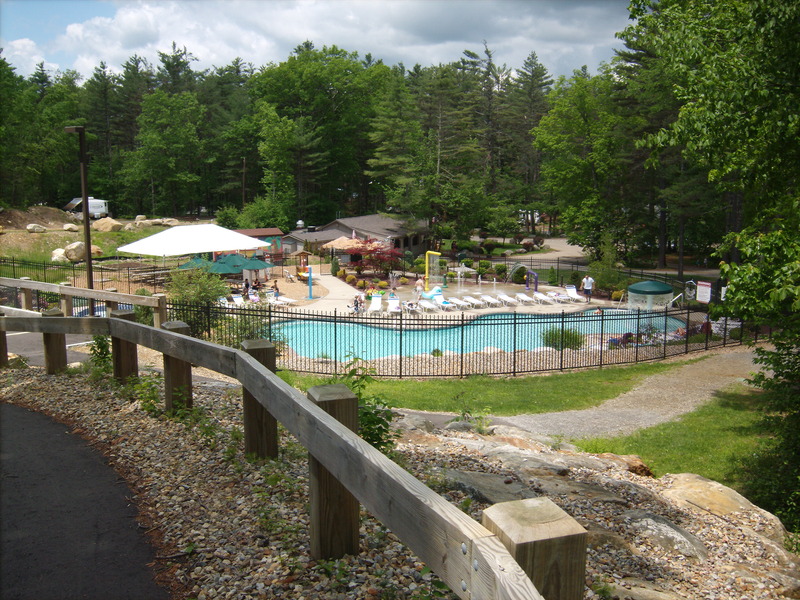 Near the center of the campground is a complex of buildings and attractions. The pool… actually its more of a water entertainment area, is impressive. The pool itself is free-form, quite large and includes a spa and several water features that would keep most kids busy for hours. There’s also a poolside bar that’s open during the warmer months. The complex has a nicely landscaped, reasonably priced ($3) mini-golf course, basketball, volleyball, and tennis courts as well as a playground for younger kids. “The Lodge”, is a large recreation hall that includes an adult lounge and “The Cave”, one of the largest video arcade rooms I’ve ever seen at a campground. Across from the Lodge is “Pine Acres Country Store” a small, but nicely stocked convenience store carrying all the basic camping necessities. There’s also a 50-seat full-service snack bar serving breakfast, lunch and other goodies including ice cream. Prices are reasonable and the food is good. The same building houses restrooms, showers, a public telephone and an ATM machine. The campground offers free Wi-Fi (Tengo). On a walk through the campground found several wi-fi repeaters, so coverage appears to be good. The signal from our site was a little low, but we had no problems connecting. They do have a 48 hour bandwidth limit but the limit is high and should be adequate for even moderate use. There appears to be just a single dumpster for your trash and it’s located near the entrance to the property. This is a large campground and it’s quite a hike to the dumpster for just about everybody. Adding a second location would be a great idea. 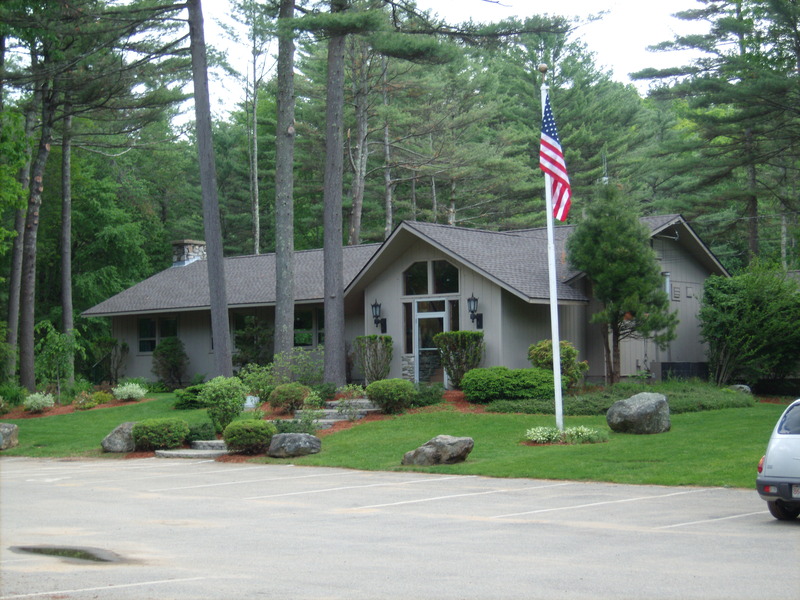 Pine Acres is pet friendly and the campground owners make every effort to accommodate your pet. They even have a pet beach! Just about every pet owner here was considerate of other campers… except for two. One never kept their dog on a leash, the other couldn’t keep their dog quiet. Its not the fault of the campground. You’ll always find a few inconsiderate campers at every campground. This is truly a family resort and all in all, one of the most pleasant camping experiences we’ve had in a long time. This one’s a keeper. Keep up the good work Pine Acres! My husband and I paid for a 4 night stay amounting to $364.00. Unfortunately, he was admitted to the hospital 2 days before our trip. He had chest pains and had a 99% blockage in the LAD artery in his heart. I called Pine Acres to ask if we could go at a later date in October or even credit us for next year. I was told there is no cancellation policy. At the most they could do was allow us 1 nights credit in October. I am so upset over this, my husband is a wonderful husband and father. He served his country in the Marines and fought in Vietnam. He has worked hard all his life. I think Pine Acres Family Camping Resort handling of this situation is disgusting! If you agree with me on this, please call them. My family had a seasonal site here from 1999-2006. Although this was 10 years ago it still sounds to be the same, the staff, especially the owner, Randy always seemed to find something to find something to complain about to my sister and I and harass my parents about dumb little things like where firewood could be stored on our site, riding bikes, guests, etc. when we where not violating any rules in the seasonal site contract. We loved the resort and had a great site but for our last season there were forced to change our seasonal site of 6 years that we loved to this tiny site that barely fit our 40 foot trailer with 16′ slide leaving us almost no room to park a 4 door sedan when our old site could easily fit 2 even 3 cars with tons of extra space. Also when they moved our trailer they destroyed the beautiful deck that their local “recommended” carpenter built back in 1999 for $2500 that was built to be detached in 2 pieces to be moved easily. When we first time arrived after they moved our trailer, it was unlevel and some of our beautiful deck boards were cracked up, The 8×20 deck was built so 8 bolts could be unbolted and it split in 2 10×8 sections but it looked like it was just dragged with their excavator instead of spending 15 minutes to unbolt the deck and move it properly and re assemble it. They didn’t even level it after they assured us they would before the move. Also, after that season the deck sagged in the middle due to the damage they did to it. Also the pre cast fireplace we purchased through the campground for $470 from the campground was damaged, 3 concrete sections were damaged which we could not repair. Also they did not place our trailer properly and just plopped it in the middle of the site. Even after politely commenting about these issues and damaged they told us they moved everything as our pre-move instructions stated (we had a copy of them too). They told us they could fix the deck and fire pit and reposition a trailer for a price that was extremely expensive, that it wasn’t even worth it and would not discount it even though they admitted fault for this! After that season we had enough and didn’t return for 2007. We had Pine Acres sell our trailer on consignment and the sold it for almost 10% less then the minimum price we said we would take (including their fee for consignment fee). I read over their new website it seems like they have added many new features like the pool, relocated the arcade, etc, allocating an expected raise in prices, even with inflation $53-$75 a night for an RV site per night! Wow! In 2006 the rv sites where arround $20-$31 a night. I almost fainted when I saw their seasonal rates. The website says seasonal sites Start at $5,100! Really? In 1999 our seasonal site was $1400, and our last season in 2006 was $1650 or $1700! I understand inflation in the last 10 years but prices are now Triple what they where in 2006. Despite the negative, we still enjoyed ourselves in the 7 years we were seasonal there and have hand many memorable times I will remember for the rest of my life. We met many great friends. My parents still talk to some of them today and some of them are still at pine acres now but say the place is not the same as it use to be. There is still a small group of seasonals who are friendly, but they are always complaining how the cloud has changed over the years and things aren’t quite what they use to be, less friendly families camping and the campground seems to care more and more about money at the end of the day. We just stayed for the weekend. I will never return. Our site was extremely uneven. The staff was anything but friendly. The rules are ridiculous! We were enjoying our campfire with friends, and had a staff member actually waiting until 11pm to come and be extremely rude to us. No friendly reminder that it is 11pm. Our kids were accused of being out causing trouble after hours the night before, when they were not out. They were in bed! The rules are over the top. You cannot even bring your own bottle of water in the pool area. On top of the $7.50 per child charge. This is certainly not a family campground! We arrived back home yesterday from Pine Acres. Boy do they have strick rules… overboard if you ask me! There wasn’t a day that went by that staff didn’t address us for, “this isn’t allowed” circumstances. For example, a pedal go-cart that we brought was not allowed (for what reason ?) even though they had them to rent in their campground, the motorized scooters that we brought were, “not allowed”, chalking on the road was not allowed, small donut floats were not allowed in the pool, no food or beverages were allowed in the pool area, etc. The hours of the pool were 11-7 and they didn’t offer much activities for the children to do, except if you have lots of money to spend at the arcade. However, they did seem to cater to barking dogs throughout the day and night, doggie messes on the road, and the pool is not as large as it appears in their brochure. I will not be returning to Pine Acres anytime soon! We just arrived home from Pine Acres resort after camping for a week with 4 other families. I have to say that we were very disappointed that the campground does not offer the poolside bar that is posted above and you aren’t allowed to bring beverages into the pool area. The Lodge is only open when they have special events going on which only seems to be on a Saturday it would be nice to be able to have some adult time while the kids are across the way at the craft tent. Security is in abundance and never did we feel the resort was not a “safe” place. Quiet hours are strictly enforced. This campground is very clean and I did like that they cater to the pets offering many areas for doggie mess bags along the way as well as the doggy park and beach for your pets to swim. I just booked my third trip to Pines Acres for July 2010. This will be our first full week stay. I love this campground and refuse to go anywhere else lol. I had a two year old last summer, now 3 and she had a blast every time. They don’t allow motorized vehicles so you don’t have to worry about your kid getting run down by teenagers. The pool has the water sprinkler things to keep kids entertained for hours and the beach is small but very cute. It’s so clean and nice and the people are friendly! They had a family dance which was cute and also do trick or tricking if you stay later in the season, it was adorable. Boat rentals, fishing, great store, mini golf etc… I would recommend it to anyone! Have fun…The prices are a little higher so I hear but its worth it! We stayed here last weekend and were disappointed. The hours of everything there were terrible! The pool was only open from 11am-7pm and the rules they have for using the pool are extreme. Couldn’t get coffee until 8am and ice cream closed at 8pm. We checked in at 3pm (check in time) on Fri. I decided to take the kids down to the rec hall so my husband could set up tents, but the rec hall did not open until after 4pm. The nice thing about this campground is that everything was very clean and modern. That was a big plus. Campsite was very small also. Had trouble putting up 2 tents and finding room to park my car. We stayed here last summer… it was very crowded, but still clean. We had an enyoyable stay here. Wow! That’s a great review. I wish we lived in that part of the country. I would love to visit this campground. It sounds great!